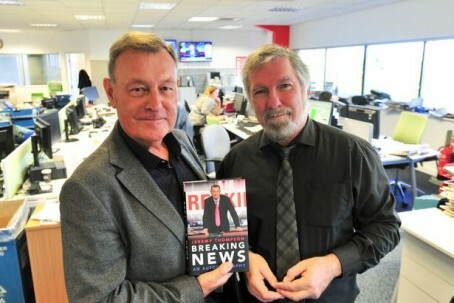 A former Sky News anchor has paid tribute to the regional daily where he began his career after paying a return visit to the paper. Jeremy was back in the city this week to promote his newly-published autobiography, entitled Breaking News, which begins with an account of his time in Cambridge. He told News reporter Chris Elliott he will “always be grateful” to the paper for his start in journalism as he recalled his early career on the paper at its former offices on Newmarket Road. After his stint at the News Jeremy moved into radio and then TV with the BBC before finally joining Sky. He was the first journalist to broadcast live as British peacekeepers entered Kosovo, witnessed Nelson Mandela’s election as president and also covered both Gulf Wars before becoming Sky’s rolling news anchor. Jeremy had joined the News four years after the assassination of John F Kennedy, and is fascinated by the recently-revealed story of how the paper received a mysterious phone call, half an hour before the president’s death, telling a reporter that ‘big news’ was about to break.